When applications call for precise movement of product, then Dorner’s newly redesigned 2200 Series Precision Move Conveyor is the answer. Dorner’s new 2200 Series Precision Move Conveyor is engineered for accurate movement of product at specific times, distances and intervals that are critical for components in the manufacturing and packaging processes of small- to medium-sized parts. Precision Move gives greater product control and accuracy to automated applications including machine integration, robotic pick-n-place, precision indexing, accurate part positioning, timed conveying, vision inspection and part handling. The timing belt and servo motor combination adds a level of precision capability to the proven 2200 Series platform. New features of the conveyor include reverse V-Guide belt tracking along the entire length of the conveyor to provide seamless belt performance without the need for side guides; expanded conveyor sizes – a small, one-inch wide conveyor option with tip-up tail for easy belt removal; and additional servo motor support with selectable motor manufacture and model numbers, as well as additional gear ratios for enhanced performance. The 2200 Series Precision Move Conveyor is the fourth and final platform introduced as part of Dorner’s newly redesigned 2200 Series family of conveyors. In April 2016, Dorner re-launched the original 2200 Series to include new features such as a redesigned frame, additional belting and expanded guiding to make the platform stronger, faster and more flexible. The 2200 Series LPZ, which comes with one or two pivot points, launched in June as a new offering in the newly redesigned series. In September, the third conveyor, the 2200 Modular Belt, debuted with additional belt options, a sleek open frame design, and a universal T-slot. 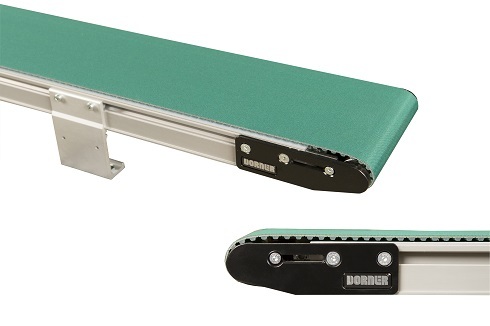 For more information on Dorner’s new 2200 Series Precision Move conveyor, visit the Product Page.